Unfortunitly, I had to break up with Birchbox. It was 6 months and I had to kiss it goodbye. Around December 24th I received my very last Birchbox which is pretty rare because I usually get it the first or second week of the month. Well since it was a little late I emailed them to see if their was a problem and firstly I didn't receive an email until a week later which is completely not good customer service. I understand that people are busy, but this isn't a company that just started, therefore they should be a little more on top of it, but that wasn't the only reason why I canceled. Lately I feel like they aren't putting any thought in to the boxes. I mean I understand I'm paying $10 for a box but every month its the same thing and I believe I've only purchased one full size product out of the box because nothing has really been worth my fancy. Overall In my opinion I think that they're are just so many other boxes out their now a days "cough cough" (My Glam) and they're really not stepping up their game. If they at least tried and put more effort into it I wouldn't have a problem. I mean come on those perfume samples that I get in every box you can get for free at department stores. December's Birchbox was actually for a good cause, and if I would have gotten it a little sooner maybe I could have purchased something. Birchbox was offering a 100% of their proceeds to Baby Buggy. Which is a great cause supplying needy families whom are less fortunate. The December Birchbox was created with products that will get you ready for frolicking and fancy fetes. 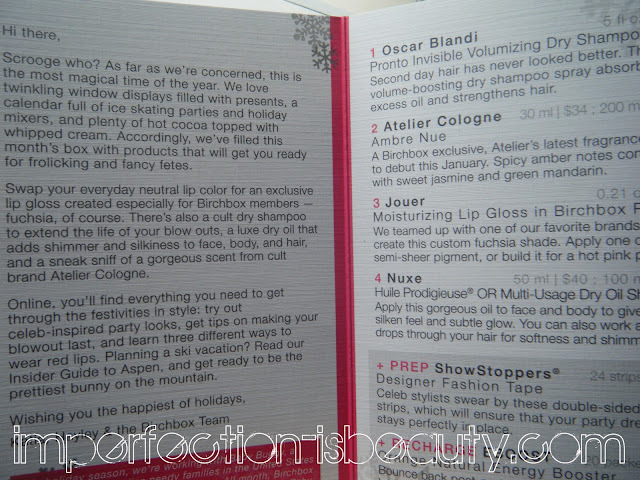 Jouer moisturizing hot fuchsia lip gloss. This is ok. I've just gotten so many Jouer lipglosses I'm to the point tired of them. Its a pretty color. Oscar Blandi invisible dry shampoo. This I'm actually really excited about trying. I always use dry shampoo every other day if I don't wash my hair. Some just don't do it and I will have to but in some cases majority are pretty decent especially if it holds up to its claim being invisible so that I don't have that yuck white mess in my black hair. not cute. Nuxe Dry usage oil. This I already got in my birchbox except the last one just wasn't glittery. Which is a total bust because I don't really like the other one so why would they send it to me again? Obviously I didn't purchase the full size? Atelier cologne. This smells alright. Haven't heard of the brand before. Its a little musky for me. Designer fashion tape. Peep Show two sided tape. I have this fashion tape that you can purchase at Micheal's, or drug stores and I don't use it to often. Like the other little extras I'll put them in a drawer and maybe one day I will get some use out of it. Eboost Natural Energy booster. I guess I see why they put this in the box the holidays could drain you, and get to busy you might need a little boost. I still don't get why they insist on putting snacks and drinks in the box but hey they tried. Can't complain. This makes me glad I didn't sign up for it. 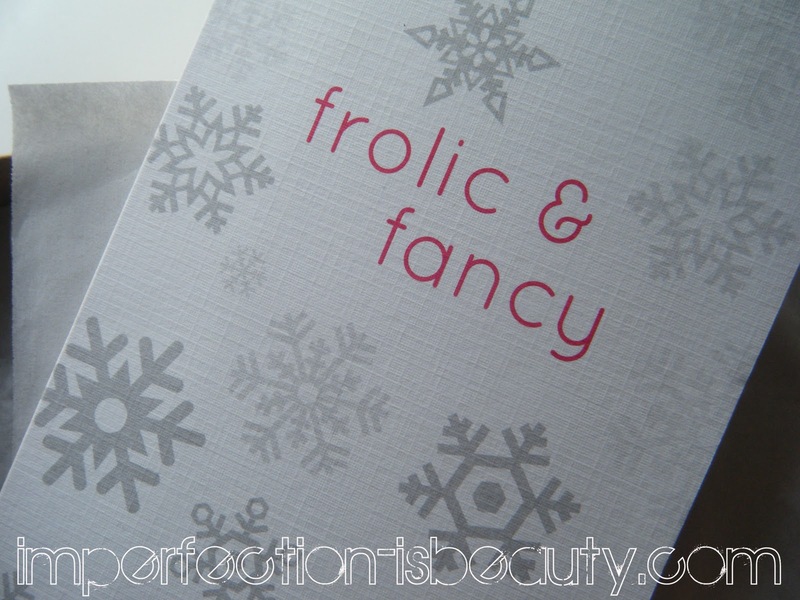 I heard about them not too long ago and wasn't very impressed by the boxes Id seen on other bloggers pages. I agree it seems like they haven't been putting any thought into them. Hopefully this doesn't happen to MyGlam, I'm pretty excited to try that out. Exactly my reasons for canceling! :/ Just not fun or worth it anymore. I felt the same why & canceled mine! Im glad I didn't sign up. The stuff they put in people's boxes, seemed to me, not relevant. I would rather have make-up like myglam or the ones that deliver to canada or the UK. I forgot the names, but those seem promising! Awwww. So sad for Birch Box, but I'm sure you can find better. I think I got the same birchbox as you. Mine also came late and they send me an e-mail saying it was because there was a delay on one of the samples? I am most likely going to cancel my Birchbox sub. too. I just signed up for the My Glam Bag. I'm hoping this will be a lot better! Hi, I saw your blog from another blog (makemeupkia) and thought I'd check it out! So glad I did! Its awesome! I totally agree. I feel like I receive the same things every month esp. perfume samples which I now have an endless supply of. I just ordered my first MyGlam Box. So excited!